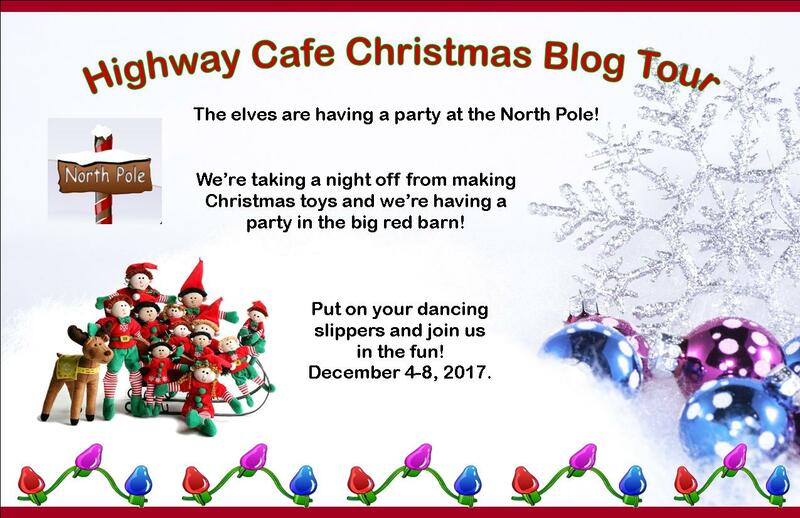 Hi, everyone, Twinkle-Toes here, I’m so happy to be involved in this year’s blog hop because I love to dance and meet new people. 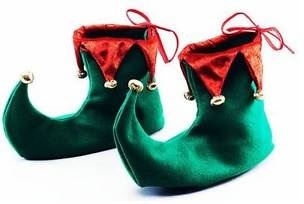 I tie jingle bells to the curled toes of my slippers so I make music every time I walk. My favorite song that I sing often around the toy-making barn is “Santa Claus is Coming to Town” because I want everyone to get excited about the coming celebrations. Another one of my favorite fun things to do is to decorate presents. A special shelf in Santa’s workshop holds last year’s Christmas cards. I grab down a few and find images to cut out, like a tree or a sleigh or a group of carolers or a star. If I’m careful, I can find two images from each card. By writing names on the back side, that cutout becomes a gift tag. I use a yard needle to poke a hole near the top and thread ribbon through or, if I don’t want to ruin the image, I tape the top to the wrapped package. Recycling makes me feel warm inside. 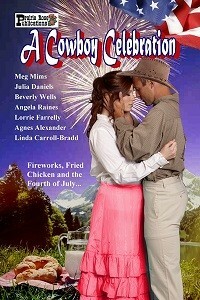 As a special thanks to you for visiting my blog, I’m giving away two ebook copies of A Year of Romance, an anthology of historical romance stories set around Halloween, Christmas, Valentine’s Day and Fourth of July. These stories comprise the first four titles in my Dorado, Texas series. Leave a comment to be eligible to win. If you have a favorite recycling tip, please share because I giggle when I find new ways to reuse. Will a justice-seeking wanderer find solace on a ranch with a stubborn widow determined to protect what is hers? Can a starry-eyed dreamer’s search for adventure overcome a taciturn man’s belief he has nothing to offer? Will falling in love with a strong-willed cowboy be the adventure a tomboy maid has been seeking? I’ll pick the name of the winners and post an announcement here on December 11th. Because this season is the time for giving, I want to tell you about a free book created by authors of one of my publishers. The 2017 The Wild Rose Press Garden Gourmet-A Holiday of Hacks includes helpful time-saving tips related to cooking and chores around the house. Get your copy here. As a special stocking stuffer, here’s the link to a free story. Gingerbread Wishes is a contemporary romance set at Christmas and is the first title is my Sugar and Spice Bakery series. 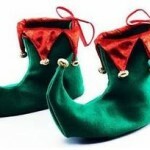 You’ll want to meet my elf friends so be sure to hop on over to the other blog posts. My passion for history and travel has taken me to every locale of my books, and short stories, set in Medieval and Renaissance England, Egypt, the Mediterranean, colonial Virginia, New England, and New York. My urban fantasy romance, Fakin’ It, won a Top Pick award from Romantic Times. I’m a member of Romance Writers of America, the Richard III Society and the Aaron Burr Association. I live on Cape Cod with my husband Chris. Get lost on journeys through history and meet folks who shook things up. I bicycle, golf, work out, walk, play my piano, am very much into the paranormal, and devour books of any genre. Since I started writing bio novels with no fictional characters, I start with the characters—I read about their journeys and accomplishments, and stick as close to possible to the historical record. I’m a strict outliner and plotter—I use Donald Maass’s WRITING THE BREAKOUT NOVEL workbook and use dozens of questionnaires. Yes, all of them—I also love Austria and Mozart, which I’ve never written about, and that’s on my list, too. How ‘wordy’ the piece can get—I have some really good proofreaders who pare it down and trim it ʼtil it’s lean and mean! I read all genres but my favorites are biographies and books about the unexplained, especially ghosts. Astronomy books also fascinate me. I hope they’ll forget their problems for a while, and escape into a world where life was simpler, yet much harder. Around the World in 80 Meals: The Best of Cruise Ship Cuisine weaves gastronomic delights around an exotic seven-day dream fantasy cruise. Imagine waking up on a different ship in a new port of call every day, and treating your taste buds to a gourmet meal every evening, each carefully prepared by one of the best chefs afloat. 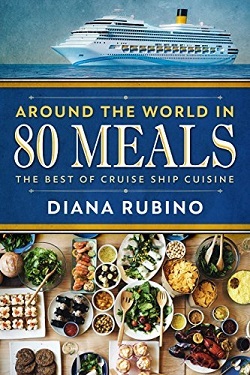 This book highlights the most interesting menus and recipes of a diversity of cruise lines, from the luxurious Cunard Line, famed for its opulent ocean liners, to a small but highly exclusive line of yachts that offer the most personalized cruise experience. This appetizer was one of the more sophisticated first courses created for President Ford. He always came to the table with a healthy appetite after swimming in the White House outdoor pool, rain or shine. Place cream cheese, cream, lemon zest, lemon juice, dill and capers in a food processor. Season to taste with pepper and combine. Butter a 6 cup terrine pan. Line base and sides with plastic wrap overhanging two inches at ends. Layer enough smoked salmon to cover bottom of pan. Layer 1/3 cup cream cheese mixture equally over salmon. Repeat layering process until all the salmon is used. The top layer should be salmon. Fold plastic wrap over salmon, pressing down gently. Refrigerate overnight. Before serving, turn onto a platter and remove wrap. Trim ends and cut into slices. Drizzle with red salmon caviar sauce (recipe follows). Serve. Combine sour cream, creme fraiche, mayonnaise, dill, and white pepper in a bowl. Stir well. Carefully mix in caviar. Cover and refrigerate 1 hour. Drizzle over salmon terrine (recipe above). Diana’s passion for history and travel has taken her to every locale of her stories, set in Medieval and Renaissance England, Egypt, the Mediterranean, colonial Virginia, New England, and New York. Her urban fantasy romance, Fakin’ It, won a Top Pick award from Romantic Times. She is a member of Romance Writers of America, the Richard III Society and the Aaron Burr Association. She lives on Cape Cod with her husband Chris. Together they own CostPro, Inc., an engineering business. In her spare time, Diana bicycles, golfs, plays her piano and devours books of any genre. The post may not be the top one but it’s there all three days. 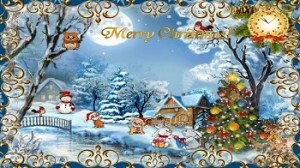 My job at the North Pole is decorating the wrapped packages with ribbons and bows or silk flowers or glitter. <giggle> I love glitter, and I love this job because I like making things look pretty. Playing holiday music while I work keeps me energized. I switch between vocals like Celtic Ladies Christmas or carols by country artists and instrumentals like Mannheim Steamroller’s Christmas in the Aire. My favorite holiday snack and drink. I can’t decide between pfefferrnusse cookies (spice cookies coated in powdered sugar) or thumbprint cookies (cookies rolled in chopped nuts with a dab of jam in the center). But I know my favorite drink is hot chocolate stirred with a mini candy cane. I’m the Secret Santa for Elf Annie, who works in the kitchen concocting decadent hot cocoa for Santa’s sleigh ride and helping Mrs. Claus bake cookies. I’m giving Elf Annie a mini-grater for the final flourish of fresh cinnamon or nutmeg on top of the whipped cream Santa loves on his cocoa. This winter/holiday recipe I got from my mother (although she was Midwest born and bred). Combine eggs, salt, 3/4c sugar, evaporated milk, water, vanilla and nutmeg. Beat well. Pour into pastry shell. Bake in hot oven (425°) 10 minutes, reduce heat to 350° and bake 20-30 minutes more, or until knife inserted hallways between edge and center of pie comes out clean. In small saucepan, stir cornstarch into cranberry sauce then add 2 T sugar. Heat until boiling, then boil one minute, stirring constantly. Stir in nuts and orange rind. Cool cranberry mixture before spooning over the custard. Cool 3-4 hours before serving. Makes 6-8 servings. 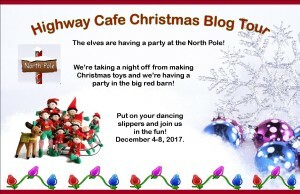 My holiday gift to participants on this blog tour is that each task completed in the attached rafflecopter earns a chance in a random drawing for a print copy of One Winter Knight, a medieval winter holiday anthology of 8 stories, or an electronic copy of Silent Signals, a historical western novella.